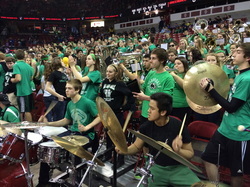 ﻿The Greendale High School Pep Band performs for all Friday home boys and girls basketball games. The ensemble usually consists of anywhere from 50-75 musicians on any given Friday. It is one of the most relaxed performance atmospheres in the program, as we perform anything from Journey to Jersey Boys and everything in between. Advanced Placement Music Theory is a course geared towards students interested in a deeper understanding of music. The course is open to any sophomore, junior, or senior student. Future music majors are highly encouraged to take this course, but the course is also a great opportunity for a student of any future college major to gain college fine arts elective credits. Because the class size is often smaller than a traditional academic class, individualized attention can be given for better chances of test-taking success. Contact Mr. Reifenberg with any questions.